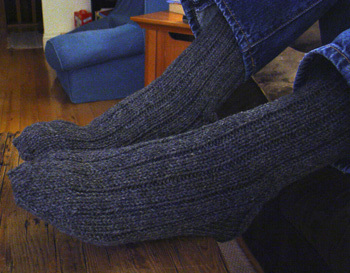 Hubby loves thick, warm socks to wear over his regular socks around the house and in his boots in the winter. It's been years since I've made him a pair and his old ones didn't even have any heels anymore! I dug up some Yarn for Sox bought years ago just for hubby socks and finally sat down to knit him new pair. I used Ann Budd's numbers from Knitter's Handy Book of Patterns , but worked the leg and foot in a 3x1 rib. I don't think he's taken them off yet!